The Misano-GP (10.9) has the offended Valentino Rossi off. But he wants to do everything in order to be able to compete again on 24 September in Aragón. Movistar-Yamaha factory pilot Valentino Rossi is making speculation about his return to the MotoGP World Championship after his track and calf leg (Thursday at Enduro-Training). 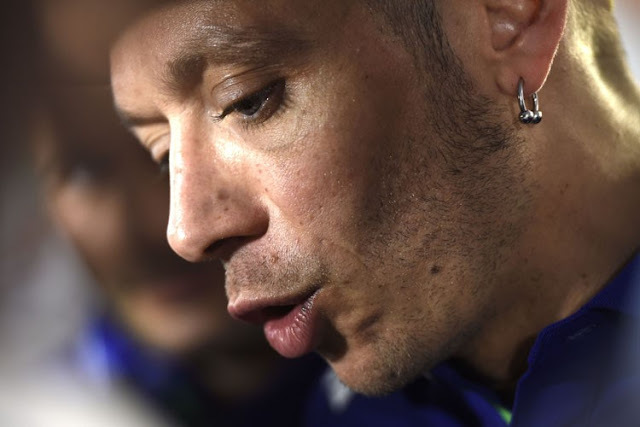 On Saturday, Valentino Rossi was dismissed at the clinic in Ancona. The 38-year-old had spent the night there from Friday to Saturday after the operation in the night on Friday. The doctors had had Rossi a night in the clinic, but then after the visit on Saturday his will yielded. From now on, his fight for the comeback in the MotoGP World Championship runs. The opinions diverge as to the date of return. The fact is that the swelling of Rossi's leg had already subsided on Friday. In addition, no muscles were injured during the fall and they were smooth fractures. Rossi's personal fitness coach Carlo Casabianca is now one of his most important reference persons. Together with the therapists and Yamaha, the comeback is planned. And it sounds like Rossi would like to return to Aragon. As a reminder, Rossi had made a comeback at the Sachsenring-GP (4th place) six years later, after Mugello's breakthrough in the track and calf. The current injuries are now being summed up as less serious than in 2010. For then Rossi had suffered open fractures. Until the first training on the MotorLand Aragón it is calculated from the operation 22 days. In 2010, Rossi's recovery time lasted 32 days before he was back on a motorcycle test. Rossis Operateur Dr. Raffaele Pascarella had first spoken of a break of 30 to 40 days. The surgeon has long since felt the enthusiasm and the iron will of the superstar. Rossi has already asked the doctors on Friday to see whether the injuries could be caused by a shorter convalescence. "Valentino already took a few steps under his supervision with his crutches on Friday, and in the face of his good condition, we have discharged him," the doctor says, but he does not want to make any predictions. "Valentino makes the decisions. I'm doing the doctor here. But nobody has given a crystal ball. " Rosso's data recording technician Matteo Flamigni is also thrilled. He had visited Rossi at the clinic on Friday afternoon. "When I saw Vale, I could not believe he was still at the operating table a few hours earlier. He has insane strength. " Also Lin Jarvis, Managing Director of Yamaha Motor Racing, was already on the bed at Rossi on Friday. At home in Tavullia, Rossi also received a visit from Teammanager Massimo Meregalli and his crew chief Silvano Galbusera on Saturday. Rossi had met Rossi seven years ago on a professional level. At that time Rossi had tested the R1 Superbike from James Toseland in Misano in the course of a fitness test in Misano. Five days later, he continued the R1 test in Brno, before returning to the Yamaha YZR-M1 on July 16, 2010 in Saxony. The crash in Mugello had happened on Saturday (5 June) in FP3. Rossi is fourth in the Silverstone GP after fourth place, and he is 26 points behind world champions Andrea Dovizioso (Ducati).